These are results from testing of the wide-spectrum KDF & granulated activated carbon filter cartridges. The test does not consider the optional fluoride, nitrate, arsenic or other cartridges which are combined to form 2, 3 and 4-canister kitchen filters. See Table One below for the most informative data. It shows output water vs. requirements. *No copper or zinc were added to the challenge water. 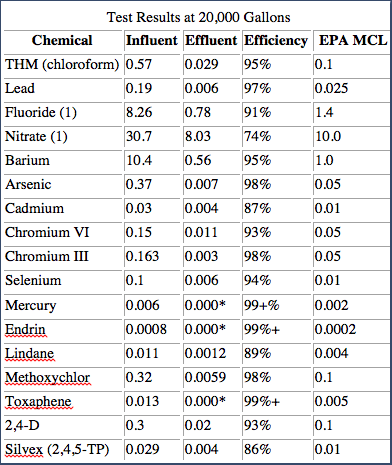 While this test shows a reduction in these contaminants, Fluoride, Arsenic & Nitrates, CuZn has found that filtration efficacy can be inconsistent in their removal in certain water conditions. As a result, we offer & recommend the use of CuZn Nitrate (model#NR-1), Arsenic (model#AR-1) and Fluoride (model#FR-1) specialty filters be used in tandem with CuZn Wide Spectrum Filters when these contaminants are present. Check more Water Filter tests and certifiation of products on Friends of water .